I remember seeing the original MIRACLE ON 34TH STREET as a child, and I really believed that Edmund Gwenn was Santa Claus. MIRACLE ON 34TH STREET is a 1947Christmas film written by Valentine Davies, directed by George Seaton and starring Maureen O'Hara, John Payne, Natalie Wood and Edmund Gwenn. It is the story of what takes place in New York City following Macy's Thanksgiving Day Parade, as people are left wondering whether or not a department store Santa might be the real thing. Because of its Christmas theme, the film has become a perennial Christmas favorite. The film won Academy Awards for Best Actor in a Supporting Role (Edmund Gwenn), Best Writing, Original Story (Valentine Davies) and Best Writing, Screenplay. It was also nominated for Best Picture, losing to Gentleman's Agreement. 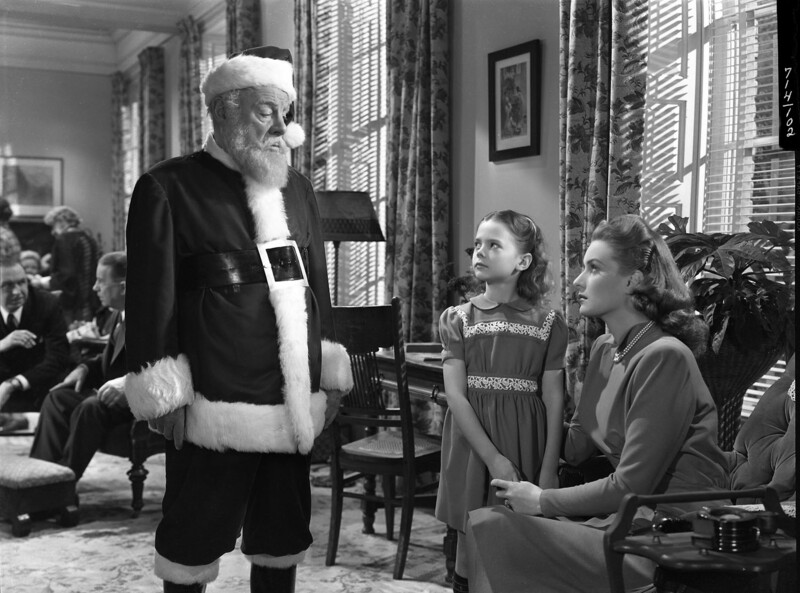 Kris Kringle (Edmund Gwenn) is indignant to find that the person (Percy Helton) assigned to play Santa in the annual Macy's Thanksgiving Day Parade is intoxicated. When he complains to event director Doris Walker (Maureen O'Hara), she persuades Kris to take his place. He does such a fine job that he is hired to be the Santa for Macy's flagship New York City store on 34th Street. Ignoring instructions to steer parents to goods that Macy's wants to sell, Kris tells one shopper (Thelma Ritter) to go to another store for a fire engine for her son that Macy's doesn't have. She is so impressed, she tells Julian Shellhammer (Philip Tonge), head of the toy department, that she will become a loyal customer. Kris later informs another mother that archrival Gimbels has better skates for her daughter. Fred Gailey (John Payne), an attorney and neighbor of Doris, is babysitting the young divorcee's six-year-old daughter Susan (Natalie Wood) and takes her to see Kris, who makes an impression on the young girl. When Doris finds out,she asks Kris to tell Susan that he really isn't Santa Claus, but Kris surprises her by insisting that he is. Fearing that he may be insane, Doris decides to fire him out of a concern that he might harm someone. However, Kris has generated so much good publicity and customer goodwill for Macy's that a delighted R. H. Macy (Harry Antrim) promises Doris and Shellhammer generous bonuses. To overcome Doris's misgivings, Shellhammer proposes getting Granville Sawyer (Porter Hall) to give Kris a "psychological evaluation". Kris easily passes the test, but antagonizes Sawyer by questioning Sawyer's own psychological health. The store expands on the marketing concept. Anxious to avoid looking greedy by comparison, Gimbels implements the same referral policy throughout its entire chain, forcing Macy's and other stores to respond in kind. Eventually, Kris accomplishes the impossible: Mr. Macy shakes hands with Mr. Gimbel (Herbert H. Heyes). Pierce (James Seay), the doctor at Kris's nursing home, assures Doris and Shellhammer that Kris's delusion is harmless. Meanwhile, Fred offers to let Kris stay with him so he can be closer to work. Kris makes a deal with Fred – he will work on Susan's cynicism while Fred does the same with the disillusioned Doris, still bitter over her failed marriage. Then Kris learns that Sawyer has convinced a young, impressionable employee, Alfred (Alvin Greenman), that he is mentally ill simply because he is generous and kind-hearted (Alfred plays Santa Claus at his neighborhood YMCA). Kris confronts Sawyer and, in a fit of anger, raps him on the head with his cane. Doris and Shellhammer only see the aftermath; Sawyer exaggerates his injury in order to have Kris confined to Bellevue Mental Hospital. Tricked into cooperating and believing Doris to be part of the deception, a discouraged Kris deliberately fails his mental examination and is recommended for permanent commitment. However, Fred persuades Kris not to give up. To secure his release, Fred gets a formal hearing before Judge Henry X. Harper (Gene Lockhart) of the New York Supreme Court. Ordered by Mr. Macy to get the matter dropped, Sawyer pleads with Fred not to seek publicity. To Sawyer's dismay, Fred thanks him for the idea. As a result, Judge Harper is put in an awkward spot – even his own grandchildren are against him for "persecuting" Santa Claus. Fred quits his job at a prestigious law firm to defend Kris and has a falling out with Doris, who calls his resignation an "idealistic binge" over some "lovely intangibles." He replies that one day she might discover that they are the only worthwhile things in life. At the hearing, District Attorney Thomas Mara (Jerome Cowan) gets Kris to assert that he is in fact Santa Claus and rests his case, believing he has prima facie proven his point. Fred stuns the court by arguing that Kris is not insane because he actually is Santa Claus – and he will prove it. Mara requests the judge rule that Santa Claus does not exist. Harper is warned privately in chambers by his political adviser, Charlie Halloran (William Frawley), that doing so would be disastrous for his upcoming reelection bid. The judge buys time by deciding to hear evidence before ruling. Fred calls R.H. Macy as a witness. Mara pointedly asks if he really believes Kris to be Santa Claus. Macy starts to equivocate, but when Mara asks him point-blank, Macy remembers the expressions on the faces of small children upon seeing Kris and firmly states, "I do!" On leaving the stand, Macy fires Sawyer. Fred then calls Mara's own young son to the stand. Thomas Mara Jr. testifies that his father had told him that Santa was real and that "My daddy would never tell a lie!" Outmaneuvered, Mara concedes the point. Mara then demands that Fred prove that Kris is "the one and only" Santa Claus on the basis of some competent authority. While Fred searches frantically, Susan, by now a firm believer in Kris, writes him a letter to cheer him up, which Doris also signs. A mail sorter (Jack Albertson) sees that it is addressed to the courthouse and realizes that the post office could clear out the many letters to Santa taking up space in its dead letter office by delivering them to Kris. Kris is uplifted by Susan's letter. Just then, Fred learns that over 50,000 pieces of mail have been delivered to Kris. He presents Judge Harper with three letters addressed only to "Santa Claus", which the U.S. Post Office (which was then a Cabinet-level department of the federal government) has just delivered to Kris. When Harper demands that Fred produce "further exhibits", the judge is soon hidden behind many bags of letters. Harper rules in favor of Kris. Afterwards, Doris invites Kris to dinner, but he reminds her that "It's Christmas Eve!" On Christmas morning, Susan is disillusioned because Kris was unable to get her what she told him she wanted most. As they are about to leave, Kris gives Fred and Doris a route home that will supposedly avoid traffic. Along the way, Susan is overjoyed to see the house of her dreams (exactly matching the drawing she had given Kris earlier) with a For Sale sign in the front yard. Fred learns that Doris had encouraged Susan to have faith, and suggests they get married and purchase the house. He then boasts that he must be a great lawyer, since he managed to do the seemingly impossible. However, when he notices a cane leaning against the fireplace that looks just like the one Kris used, he wonders "Maybe I didn't do such a wonderful thing after all."